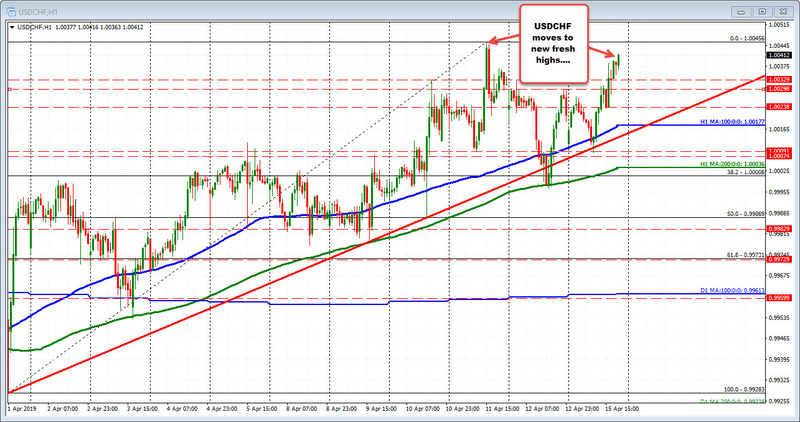 The USDCHF is moving to a fresh session high. The EURCHF is also looking to test highs of the day. "We always stress the point that we have still room to lower interest rates further and we have also room to use the balance sheet, if necessary, for interventions in foreign exchange markets. Both instruments are here to use depending on the situation,"
Looking at the hourly chart above the pairs bottomed at the 200 hour MA and rebounded higher. Today, after an earlier up and down prive move in the Asian session, the pair have been moving higher.